Alpha Centauri is the closest star apart from the Sun, and is located only 4.35 light years away. 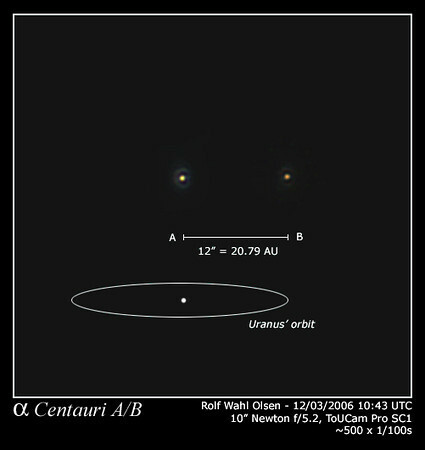 It is a triple star system of which the two brightest components have been separated in the image. These stars complete an orbit around each other in 80 years with an average separation of 23 times the distance from the Earth to the Sun, which is roughly equal to the radius of Uranus' orbit around the Sun. The third component, Proxima Centauri, is a small dwarf star orbiting much further away from the two main stars. Have a look at this image for a wide field view of Alpha Centauri with a much longer exposure.